He took his time making it official, but Wisconsin Governor Scott Walker’s announcement that he’s seeking a third term was one of the top political stories of 2017. It seems long ago, but was actually just September 2015, when Walker ended his campaign for President. 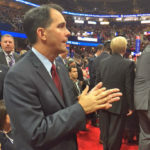 “I believe that I’m being called to lead, by helping to clear the field in this race so that a positive, conservative message can rise to the top in this field,” Walker said. The announcement setting off immediate speculation about when or if Walker would seek reelection. In June 2016, the state’s longest-serving governor, Tommy Thompson, offered a word of caution. “I’m not sure that he should” Thompson said, adding that Wisconsin politics had become much more divisive than he liked.